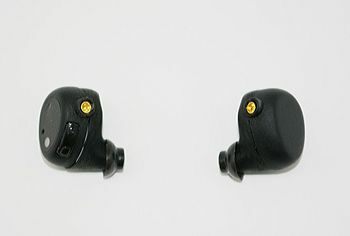 NEC improves the safety and security of computing with "hearable device"
Tokyo, May 23, 2017 - NEC Corporation (NEC; TSE: 6701) today announced the development of a prototype "hearable device" (earphone device) user authentication technology, aiming to achieve new forms of convenient, safe and secure computing. Security and safety are primary concerns when making use of any product or service. In recent years, as computers and smartphones have become more essential to daily life, reports of losses from leaked passwords and accidents related to smartphone use have become increasingly common. NEC's hearable device user authentication technology helps reduce these risks by providing an additional layer of personalized security that allows users to devote greater attention to their surroundings. 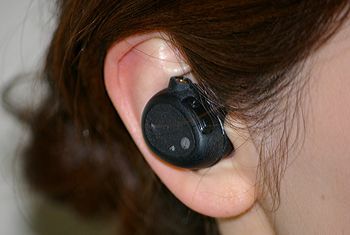 The device is equipped with NEC's unique otoacoustic authentication technology, which recognizes the characteristics of a user's ear in order to enable hands-free authentication of an individual. This enables users to safely and securely activate their computing devices, without distracting their attention to key in a password. In addition, the prototype's motion sensor can be used to estimate user locations, even in indoor environments where GPS signals are obstructed. This can help provide guidance to users who become lost in large facilities, such as shopping malls or airports. Moreover, since the device is situated in a user's ear, it is subject to less shaking and noise when compared to wearable devices worn around the wrist or neck, enabling it to reliably obtain information. This also means it can recognize the orientation of a user's face, a change in posture, or activities such as walking or running. In the future, it is expected to track pulse rates and other biometric information. This authentication device easily connects to a smartphone or other computing devices via BLE (Bluetooth Low Energy) in order to access the Internet and to take advantage of a wide range of services, including map sites for city guidance. Moreover, the device consists of a microphone, speaker, and a 9-axis motion sensor, which is equipped with acceleration, gyroscope, and geomagnetic sensors. In order to promote the development of a wide range of services for the device, NEC will publicly provide application programming interfaces (API) for its otoacoustic authentication technology and indoor positioning technology, in addition to providing device manufacturers with design specifications for the hearable device prototype. "NEC is aiming to commercialize hearable platform services that combine individual authentication, indoor positioning, acoustic AR (augmented reality), vital sensing and other technologies by the end of 2018," said Tomonori Kumagai, General Manager, Business Development Division, NEC Corporation. "Going forward, NEC will accelerate trials in collaboration with service providers and device manufacturers, while proposing new approaches to computing that utilize these technologies."